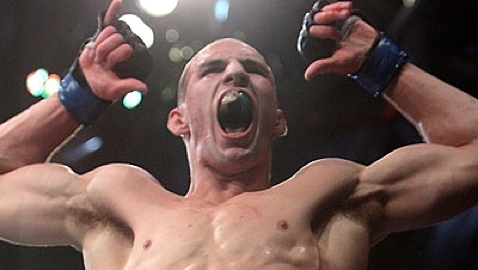 Rory MacDonald defeated Demian Maia by unanimous decision in their UFC 170 fight on Saturday night in Las Vegas. MacDonald recovered from a difficult first round to pick away at Maia and earn the judges’ call with scores of 29-28 across the panel. Maia immediately started shooting for takedowns, securing a single-leg shortly thereafter. After getting to mount, Maia punished his opponent with a mixture of punches and elbows. After scooting out of from under Maia’s mount, MacDonald was able to return to his feet and the two traded strikes through the end of the round. MacDonald found his rhythm in the second round, picking away at Maia as the Brazilian fighter began to slow down. MacDonald found success in stuffing his opponent’s takedowns, keeping the fight in a standing position and bloodying up Maia’s face. The strikes continued to land in the third round as MacDonald worked on the feet. It wasn’t until Maia secured a slam to put his opposition on his back that the fight went his way again. MacDonald, however, lifted Maia off of him and returned to the fight to where he had been scoring with so many strikes. With the win, MacDonald returns to the win column after his previous fight, a loss to Robbie Lawler, and improves his record to 16-2.